Read the full post on Urban Cultural Studies. How do maps reflect a place and its culture? How do maps inscribe meaning into place? What do maps conceal about a space and its culture? This week, my class engaged these questions at the St. Louis Map Room. 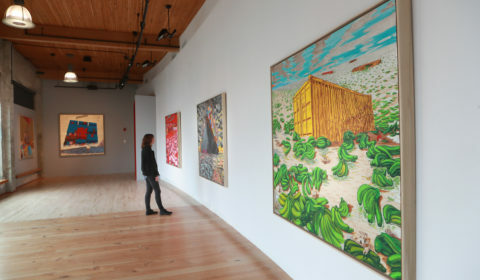 The Map Room is a temporary exhibit located at Stevens Middle School, a shuttered St. Louis Public School in Vandeventer, a North St. Louis City neighborhood. We entered the school, walked down a hallway, and then turned right into the gymnasium. There we saw dozens upon dozens of huge maps (about 15’ by 15’), most of them hanging vertically in two rows. On a platform at the center of the room, another huge map rested. Another smaller map appeared on the t-shirt of a staff member. All maps were of St. Louis. We met Emily Catedral, a teaching artist and site coordinator for the Map Room. She led our engagement, first giving a pointed lecture about the role of maps in history and culture. This assignment was part of “Urban Ethnography in St. Louis,” a course I am teaching this semester at Washington University in St. Louis. Our geography divided us into two teams. Blue marked those from Jeff-Vander-Lou; red designated those of us from Forest Park Southeast. And then, with a simple reorientation, those divisions vanished, at least temporarily. In their stead: new partnerships. Each pair included blue and red forged across neighborhood boundaries. My partner and I—both black women in our 30s—boarded the school bus together. Born in St. Louis, she grew up and spent most of her life in Jeff-Vander-Lou (JVL); recently she completed an international MBA. The beaches in Thailand, and the heat in India, the revelry in Ireland—this filled our conversation. Time on our phones on Facebook trying to figure out if we had friends in common also filled our time. Read the entire article, at the Common Reader‘s site, here. Last month, I spoke at the first Americanist Dinner Forum of the 2016-2017 year. Peter Benson, Associate Professor of Anthropology and Director of Graduate Studies in the Program in American Culture Studies (AMCS), curated the engaging and moving event. The theme: “When Artists Die: On Prince et. al.” Pat Burke, Associate Professor of Music, and Jeffrey McCune, Associate Professor of Women, Gender, and Sexuality Studies were amazing panelists. Pat brought our attention to how race frames the narratives of artists’ deaths; Jeffrey made us sonically focus on Prince’s voice and how it stages relationships among religion and sound. My remarks–with media–are below. We can think about Prince through his falsetto. [“Kiss”] I was born in 1982; my first memories of Prince were not visual but sonic—on the radio in the car with my mom. One time as he came on, she turned up the radio and said “Prince can squeal. I love a man who can squeal.” My mom’s preferences for black male vocalists who could squeal—Prince, Al Green, Marvin Gaye—shaped my own. In fact my first concert was—at five or six—Michael Jackson. We had lawn seats in very back but my proximity to my mom made it the best seat. When Michael Jackson started “The Way You Make We Feel,” my mom sang in my ear “you knock me off on my feet now Jazzy.” Through my mom, Michael was speaking to me. But back to the falsetto. Falsetto, some theorize, makes black male singers more feminized and therefore more palatable to white audiences. Andrew Grant Jackson describes how Smokey Robinson’s “beautiful falsetto made him nonthreatening to white audiences.” (33) Lisa Taylor details Prince’s “strategy of holding black audiences, while always aspiring to cross over to the far more profitable white leisure audience” as “inform[ing” the construction of his image throughout his career” (166). But there are many ways to be and be seen as black. These readings particularly cheapen Smokey Robinson and Prince, singularizing their music as successful only by reaching white audiences. So as we remember Prince, and Marvin, and Michael, I want to think about them through the black falsetto in five other ways. First, we can think of Prince’s falsetto, and Smokey’s, and Marvin’s, and Michael’s, as part of black musical repertoire. In The Black Diaspora: Five Centuries of the Black Experience Outside Africa, Ronald Segal details how “[t]he vocal embellishments were those of black musical tradition and included growls, falsetto, humming, moaning” (383). the deliberately forced, deliberately “false” voice we get from someone like Al Green creatively hallucinates a “new world,” indicts the more insidious falseness of the world as we know it. (Listen, for example, to “Love and Happiness.”) What is it in the falsetto that thins and threatens to abolish the voice but the wear of so much reaching for heaven? I found this excerpt in Fred Moten’s “Black Mo’Nin” in the edited collection Loss: The Politics of Mourning. Moten’s chapter is about the image of Emmett Till at his funeral. I wont reproduce that here but I ask for us to hold Till’s memory, the memory of black teenager killed for flirtation with whiteness. In In the Break, Fred Moten writes “Mackey understands the falsetto to be the strained, maternal, and material residue of ‘a legacy of lynchings’ that illuminates and amplifies that legacy’s ongoing sexual cut of sexual difference.” Falsetto as enacting a new world ties to falsetto as mourning for the anti-blackness in this one. Black falsetto makes new worlds, mourns this one, as critiques capitol deemed necessary to its sonic circulation. That is where I would close if not for a recent experience. But I want to close thinking about when artists live. This summer I bought a ticket to LouFest to see Ms. Lauryn Hill. I told friends how I excited was and received a set of similar responses: “she’s not going to perform,” “she’ll be three hours late,” “she’s always drunk,” “you shouldn’t go.” Press frames Ms. Hill similarly. In 2014, Chicago-based writer Stefan Schumacher penned a really mean article in Medium entitled “It’s Finally Time to Stop Caring About Lauryn Hill.” Even though there was a very caring response from Talib Kweli, discourse about Lauryn Hill present as not her brilliant past has rendered her dead. In Lemonade, Beyonce cites Malcolm X. His articulation makes sense of Lauryn Hill as disrespected, unprotected, and neglected. As she if she is already dead. I am especially drawn to the notion of black women musicians as archivists, excavators and agitators who use sound and musicality as ways to galvanize and disturb historical memory in the public sphere. One archivist, Brooks writes, is Lauryn Hill in “Black Rage,” Hill’s 2012 reimaging of “My Favorite Things.” Lets watch it. 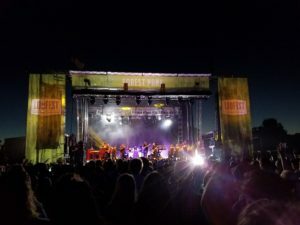 Daphne Brooks says of Lauryn Hill “Her performative threat, her compelling insinuation, is one that we might act on to create a new time…” That night at LouFest, Lauryn Hill started pretty much on time. Her performance—as a skillful conductor of the seven-piece band and vocalists—was one of the best performances I’ve ever experienced, reorienting me to revel in the joy and strain of her sonic creations, and in the presence of this black woman who has been so disrespected, unprotected, neglected but who is still with us. When we think about when artists die, we must also consider how those, like Ms. Lauryn Hill, who many mark as dead, live, still creating new time for us.